This Persistence Market Research report examines the global fifth wheel coupling market for the period 2017–2025. Fifth wheel coupling is basically a coupling device that is used to connect the towing truck and semi-trailer, leading tracker, dolly or tractor unit. The fifth wheel coupling allows the trailers to slip into the fifth wheel and remain locked into it. In order to have an ease of understanding and for the better organization of the report, the report on global fifth wheel coupling market has been divided into four distinct parts. The first part of the report contains the introduction section that contains the executive summary of the report along with the market taxonomy and the definition of fifth wheel coupling device. This valuable section of the report also contains information on the product life cycle and patents that are applicable in the fifth wheel coupling market. This section of the report also contains information on the market viewpoint and the macroeconomic factors operating in the global fifth wheel coupling market. Also, the value chain analysis of the global fifth wheel coupling market is also provided in this section of the report. The second part of the report contains the global fifth wheel coupling market analysis and forecast by product type, capacity, operation, sales channel and by region. This section of the report contains important market numbers in the form of market attractiveness index, incremental dollar opportunity and basis point share analysis. The third part of the report contains the regional fifth wheel coupling market analysis and the regions are chosen as per the market taxonomy. In this section of the report, the regional market numbers are discussed in great detail along with the regional drivers, restraints and trends affecting the respective regional markets. The last part of the report features the competition landscape of the global fifth wheel coupling market and has information on the key players operating in this market. The competition landscape contains detailed information on the important companies operating in the global fifth wheel coupling market in the form of company description, product overview, key developments, strategic overview and key financials of each of the featured companies along with the SWOT analysis of the companies. This competition landscape is a valuable part of the report as it contains all the necessary information to study the leading companies operating in the global fifth wheel coupling market in detail and also reveals how they implement their strategies and vision to stay at top in this highly competitive market. Overall market size has been analysed through historical data, primary responses, and public domain data. 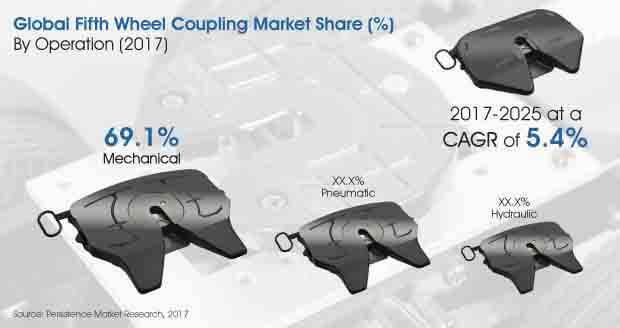 Revenue of companies in the global fifth wheel coupling market has been benchmarked to ascertain the market size for the base year. Macroeconomic indicators such as GDP and industry growth have been considered to forecast the market size over the forecast period. The historical growth trend of end-use industries, market participants’ performance, as well as the present macro-economic outlook has been taken into consideration for estimating the overall market trend forecast. This data is then validated using the triangulation method and is extensively scrutinised using advanced tools to garner quantitative and qualitative insights into the global fifth wheel coupling market. Automotive, mining, construction, waste management and petrochemical industries represent potential growth opportunities for manufacturers of fifth wheel coupling devices. Due to economic growth, construction and industrialization is increasing, which in turn is accelerating the growth of fifth wheel coupling market as it provides transportation solutions to these industries. Some of the prominent market participants which are providing fifth wheel coupling are Jost Werke AG, SAF Holland and Fontaine Fifth Wheel etc. Due to the growing petro-chemical and mining industry, especially in Europe and Middle East & Africa, the demand for transportation is likely to receive a boost. This will increase the need of fifth wheel coupling devices for cost-effective movement of materials, providing safety and increased productivity. Growing waste management industry is also anticipated to experience a gradual rise and this will positively impact the fifth wheel coupling market. Increasing awareness among the consumers regarding environment protection is projected to fuel the growth of waste management industry which in turn, increases the growth of logistic industry and indirectly affects the growth of fifth wheel coupling market. Capabilities such as high load carrying capacity will furthermore drive the demand in the market. North America is a matured automotive market and has a high penetration for technologically advanced and high cost products. A large share of commercial vehicles in the region is equipped with advanced fifth wheel coupling system such as fifth wheel backup camera system. Furthermore, significant sales of heavy commercial vehicles in the North America region makes the market more inclined towards adoption of advanced technologies. For instance, in 2017, Fontaine Fifth Wheel Company has developed the lightest steel fifth wheel assembly that has a high load capacity. Freight vehicles are the prominent contributors to climate change, emissions and fuel consumption in the on-road transportation sector. Furthermore, tractor-trailers account for a significant percentage of emissions, fuel consumption, and vehicle-kilometers traveled from heavy-duty vehicles. This factor positively impacts the fifth wheel coupling market. Latin America registered a significant growth rate and is expected to be the most attractive region for the demand of heavy duty commercial vehicles, owing to increasing construction and mining activities in the region. Government policies and promotion of fuel-saving technologies to reduce GHG emissions and fuel-consumption within the heavy duty vehicle fleet is another factor that is likely to fuel the demand of new advanced trailers, which in turn accelerates the growth of fifth wheel coupling market. As per the data provided by Persistence Market Research, the hydraulic segment in the operation category was estimated to be valued at nearly US$ 57 Mn in 2017 and is anticipated to reach a valuation of nearly US$ 100 Mn in 2025, exhibiting a CAGR of 7.3% during the assessment period 2017-2025. The pneumatic segment in the operation category was estimated to be valued at nearly US$ 84 Mn in 2017 and is likely to reach a valuation of nearly US$ 140 Mn in 2025, exhibiting a CAGR of 6.5% during the period of assessment. Shandong Fuhua Axle Co., Ltd.